This 43-year-old woman presented to the angiography department three years ago with pain in the lower abdomen. She underwent resection of an intrauterine fibroma in 1997 and a C-section in 2002. In September 2005, the question was raised regarding a possible malformation of iliac vessels on the left side. AV-fistula involving the left internal iliac artery. Scans were acquired on a 1.5 T Siemens Avanto system using a time-resolved MRA-technique with view-sharing (TWIST, time-resolved MRA with interleaved stochastic trajectories, TR/TE 2.94/0.91 ms, voxel size 1.7×2.3x3mm3 with a temporal resolution of 3 sec per 3D-data set, parallel imaging GRAPPA factor 2) after bolus injection of 14 ml of a 0.5 M formulation of a gadolinium chelate at 1.5 ml/sec. No bolus timing was performed. The sequence was started 5 sec before the contrast agent was administered to allow for a non-enhanced mask frame. The patient was asked to hold her breath as long as possible. There is a marked dilatation of the left internal iliac artery – particularly compared to the contralateral side. 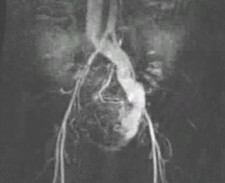 Immediately after the arterial arrival of the contrast agent early venous return indicative of an AV-fistula can be seen. The left common iliac vein and the inferior vena cava are substantially enlarged due to the high volume load.